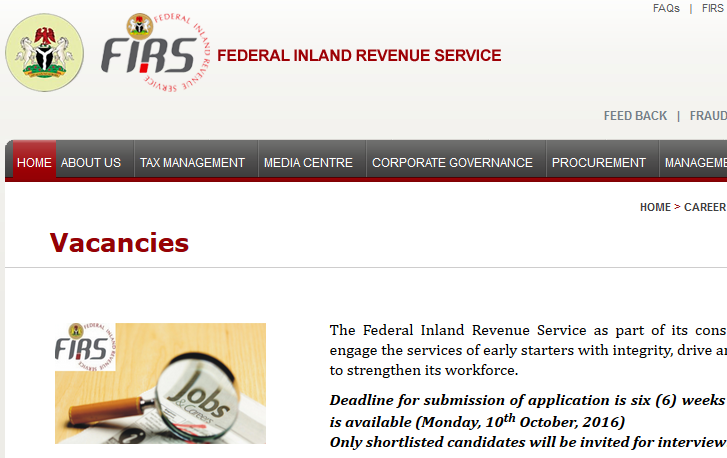 The Federal Inland Revenue Service (FIRS) Vacancy/employment adverts for 2016 is out and recruitment in Progress. The Federal Inland Revenue Service as part of its consolidation strategies, wishes to engage the services of early starters with integrity, drive and desire to win professionally, to strengthen its workforce. Asst. Mgr Tax – GL10/SL08. A Bachelor or Master’s Degree in Accounting, Law, Economics, Banking & Finance, Engineering, Geology, Statistics, Computer Science or other relevant discipline in the quantitative field. A Higher National Diploma in Accounting, Economics, Banking & Finance, Engineering, Geology, Statistics, Computer Science or other relevant discipline in the quantitative field. Computer literacy and conversancy with Microsoft office and Web. Applications and the use of relevant applications for efficient delivery of service. Strong team spirit and ability to effectively delegate. Knowledge of business/industry environment within which taxpayers operate. Ability to work as a regulator with the courage to ensure full compliance with laws. Be of good character and must not have been found guilty of any criminal offence or should not have been indicted at or dismissed from their places of work or other environment. Present a certificate of State of Origin and Local Government signed by the Chairman/Secretary of their Local Government. Certificates endorsed by Liaison offices will not be accepted. FIRS considers computer proficiency a key requirement for anyone who aspires for a job in the Service. Accordingly, Applicants are expected to fill their applications online. Application forms can be found at the FIRS website www.firs.gov.ng/careers . This FIRS application portal will be available with effect from Monday, 29th August, 2016. Please follow the instructions to fill in your application. Only applications in respect of the advertised positions would be considered. All individuals are expected to apply to only ONE position. Multiple applications by one Candidate for more than one job will be disqualified. Upon submission, applicants will receive an acknowledgement containing a reference number which must be quoted in all future correspondences. Deadline for submission of application is six (6) weeks from the date the web portal is available (Monday, 10th October, 2016). Please inform others who might need the information. Application portal will open on Monday 29th August 2016.